Clean, shine and protect your boat's metal surfaces! The marine environment, particularly near the salty oceans, wreaks havoc on your boat’s uncoated metals. The Marine 31 Stainless Steel Polish & Sealant Combo includes what you need to quickly polish away salt stains, surface rust, oxidation and weathering from your boat's stainless steel trim rails, seat frames, rod holders, tow hooks, and more and protect them from further weathering. This inclusive kit includes the appropriate towels and applicators. 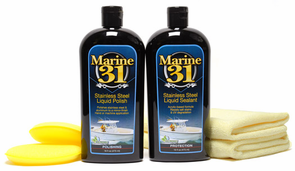 Marine 31 Stainless Steel Liquid Polish cleans and improves the luster of stainless steel. The environmentally safe micro-fine polishing agents remove years of oxidation and weather dulling to restore the brilliant shine your boat deserves. 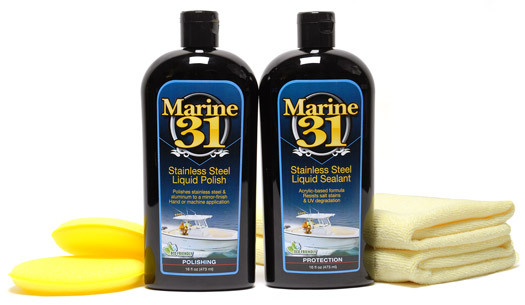 Marine 31 Stainless Steel Liquid Polish is safe for aluminum and other soft metals as well. Marine 31 Stainless Steel Liquid Sealant protects all metal surfaces with a durable acrylic-based polymer formula. Marine 31 Stainless Steel Liquid Sealant seals your boat's metal from the harsh nautical environment that is constantly attacking it. This revolutionary sealant creates a slick, high-gloss finish that sheds water and dirt effortlessly. Marine 31 Stainless Steel Liquid Sealant is harbor-safe and eco-friendly. The Poly Foam Applicator can apply any wax evenly without creating any swirl marks. They are absorbent in order to catch drips or runs, and they apply perfect, even coats of paste waxes and polishes. A Word from the Captain's Chair: The sea works hard to dull the shine of our boat's metal! The Marine 31 Stainless Steel Polish & Sealant Combo turns back these effects by polishing metal to a high luster and protecting it under a coat of durable acrylic polymers. Anchors up! A total retail value of $66.94. You save $16.95!